Zinnia haageana ‘Old Mexico’ is an All-America Selections Winner from forty-three years ago–a cultivar that has stood the test of time. Considering its performance in trials done by The Gardens at the University of Georgia, that decades-long popularity is no wonder. It has performed similarly well this year at UBC. 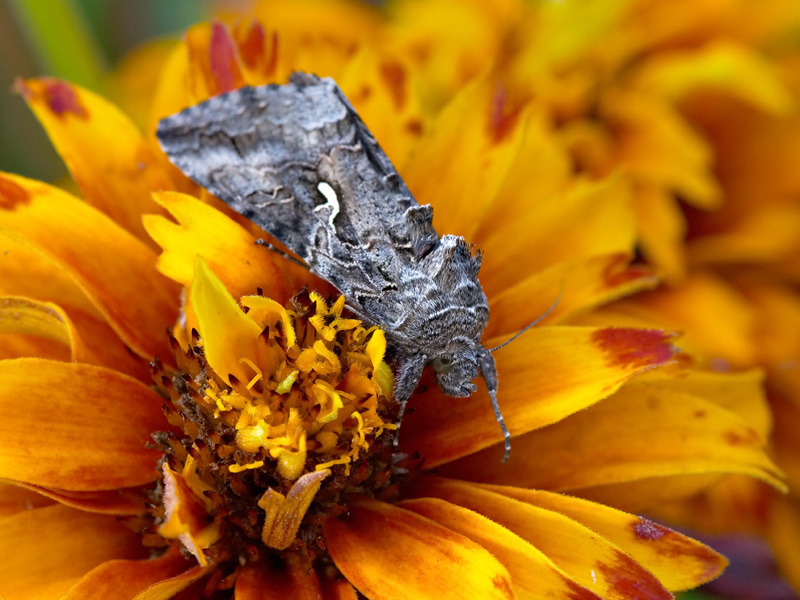 Autographa californica (Noctuidae) is the moth, commonly known as the alfalfa looper. The sickle-shaped white spot on the wing is an easy diagnostic feature. Moderate populations of loopers may be more beneficial than harmful, as they support populations of natural enemies that also attack the more destructive bollworms, budworms, and beet armyworms. Similar statements are made on the site regarding loopers and other Californian crops such as lettuce, artichoke and tomatoes. Along with a suite of predators, alfalfa looper is also susceptible to a baculovirus.